At the time I’m writing this, 2017 is only hours away. I love the new year. I love how excited everyone is to move forward, make progress. Fresh starts can be miraculous. While many people are cynical about resolutions and goals, I firmly believe a fresh start is often just the thing we need to reenergize our spirit, rejuvenate our souls, and reignite hope. The New Year is written into every calendar every year, which means we don’t even have to PLAN the fresh start. 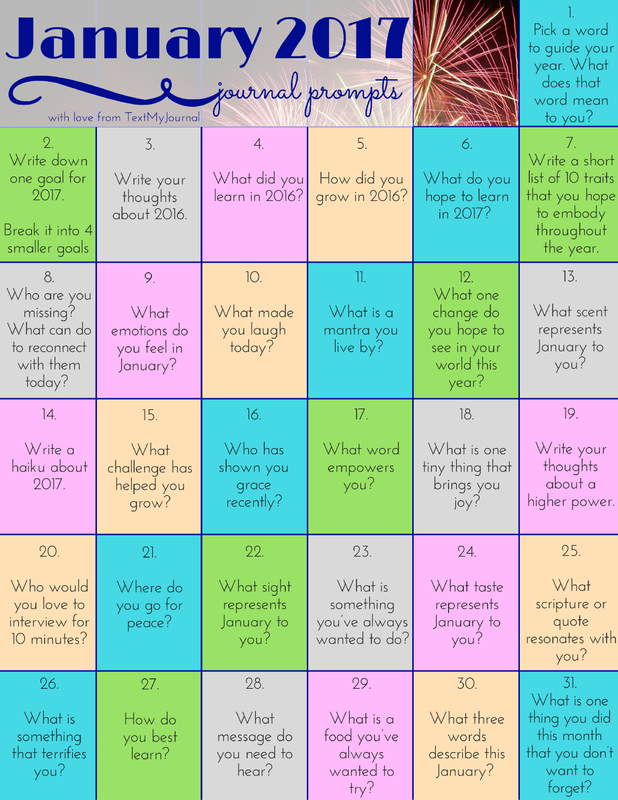 So, with fresh starts in mind, here are 31 journal prompts just for January in a hope that you, too, can find a fresh start you’re hoping for. Happy New Year, and may God bless you as you seek fresh starts. Pick a word to guide your year. What does that word mean to you? Write down one goal for 2017. Take it one step further and break that goal down into 4 smaller quarterly goals. Write your thoughts about 2016. How did you grow in 2016? What do you hope to learn in 2017? Write a short list of 10 traits that you hope to embody throughout the year. Pick one to focus on this month. Who are you missing? What is one thing you can do to reconnect with them today? What emotions do you feel in January? What is a mantra you live by? What one change do you hope to see in your world this year? What scent represents January to you? Write a haiku about 2017. What challenge has helped you grow? Who has shown you grace recently? What is one tiny thing that brings you joy? Write your thoughts about a higher power. Who would you love to interview for 10 minutes? What sight represents January to you? What taste represents January to you? What scripture or quote resonates with you? What is something that terrifies you? What message do you need to hear? What is a food you’ve always wanted to try? What three words describe this January? What is one thing you accomplished this month that you don’t want to forget?